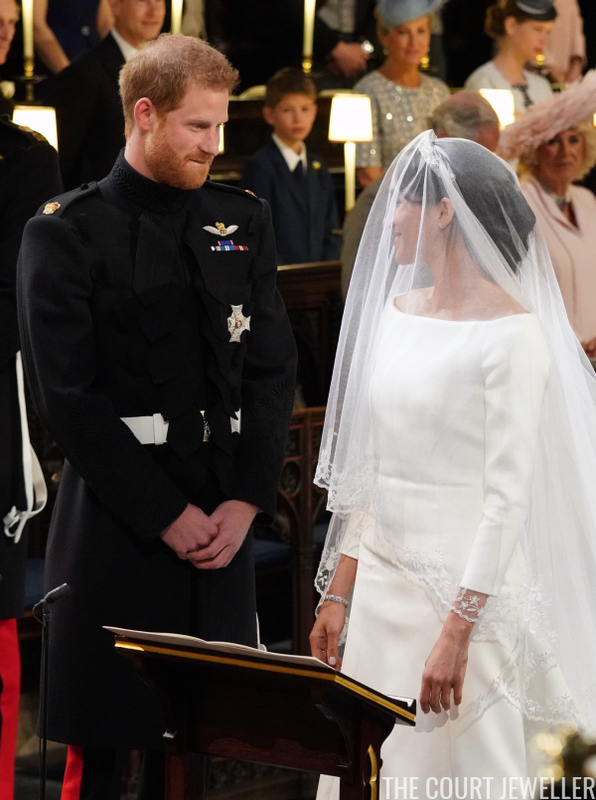 Meghan Markle and Prince Harry are officially married, so it's time to marvel at the sparkle of the new Duchess of Sussex's wedding jewels! 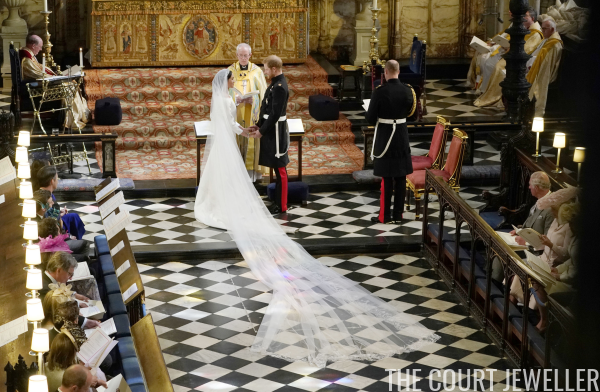 With her Givenchy wedding gown, Meghan wore plenty of diamonds, including an intricate diamond tiara from Queen Mary's collection. The palace is calling this one "Queen Mary's Diamond Bandeau Tiara," so we'll go with that name for the piece. 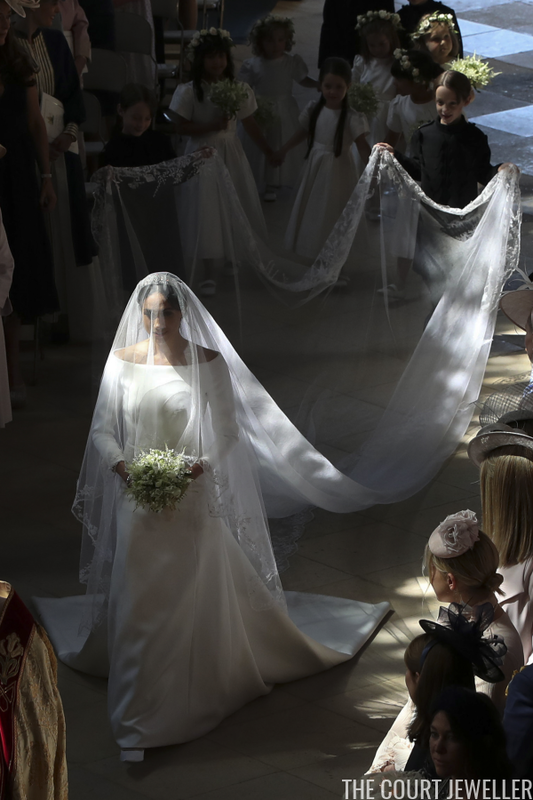 The official press information noted, "The veil is held in place by Queen Mary's diamond bandeau tiara, lent to Ms. Markle by The Queen. The diamond bandeau is English and was made in 1932, with the entre brooch dating from 1893." That central element, the County of Lincoln Brooch, was one of Queen Mary's own wedding gifts. 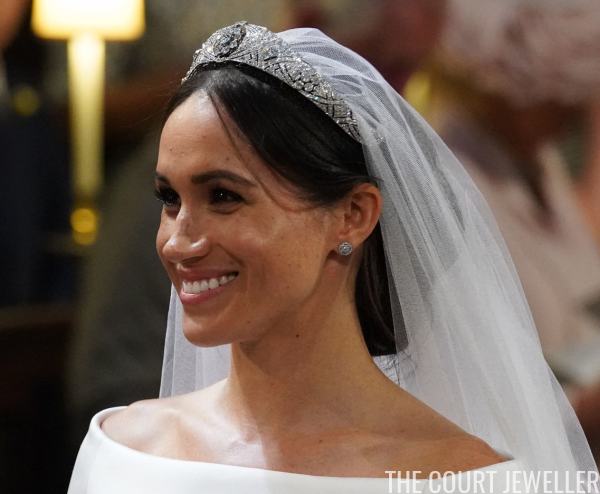 Click here to see close-ups of the brooch/tiara! Meghan also wore her new diamond stud earrings from Cartier, which we covered in an earlier post here. Some had suggested that these might be her wedding earrings, and they were right! The diamond bracelet that Meghan wore on her right wrist is also from Cartier. 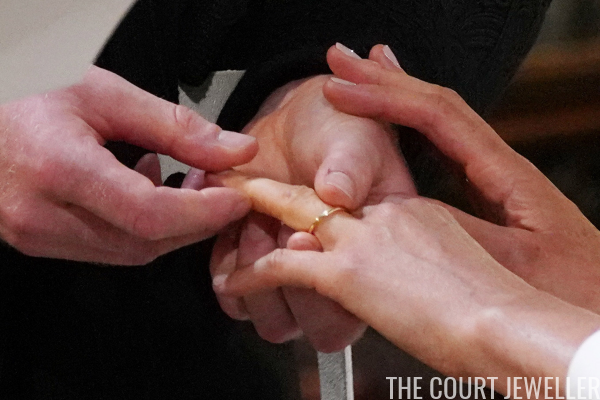 Following royal tradition, the wedding ring that Harry gave to Meghan is made of Welsh gold provided by the Queen. 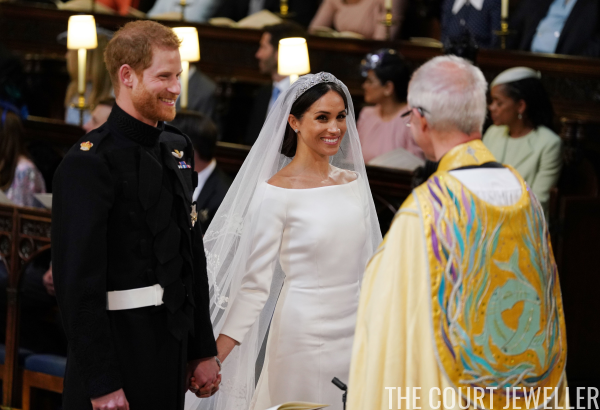 It was made by Cleave and Company, the same firm that made Meghan's engagement ring. Harry's ring, made of textured platinum, was made by the same jeweler. ...and the magnificent veil, which was designed to include floral motifs from all 53 Commonwealth nations.